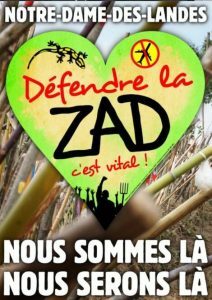 Institute for Social Ecology > Article Archive > The ZAD Becomes Compost: LONG LIVE THE ZAD (Zone a Defendre)! 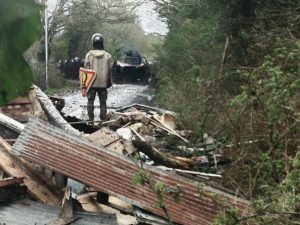 When something you have witnessed, loved and cared for is destroyed and uprooted, whether it is a forest, a species, a community or a culture, it can wreck the spirit. 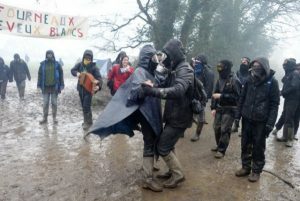 The trauma of these violent actions, informed by greed and ignorance, can ripple out widely, encouraging resistance, but it requires attention. In order for the suffering to become compost from which we can plant our visions again, it needs amplification. Writing in the wee hours, on the Pacific coast of North America, I am hoping that these words will be heard, knowing that our peaceful warrior friends in the southwest of France are facing violence today. 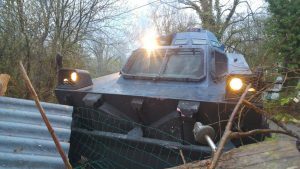 In October 2017 we were able to visit the ZAD, a wonderful and complex community in France that inspires revolutionary thoughts and actions. 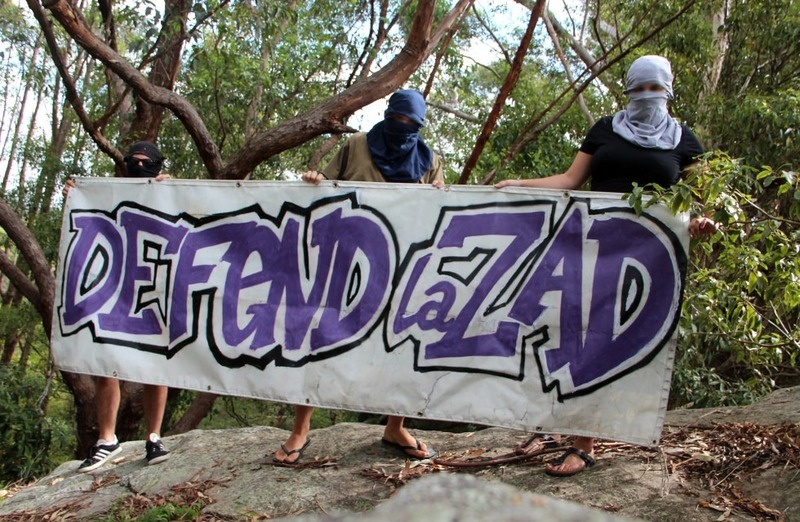 Most folks, including activist folks, on this side of the pond have never heard of the ZAD. We’ve been too busy with the ever-escalating messes in our own backyards to pay much attention to visionary projects elsewhere. 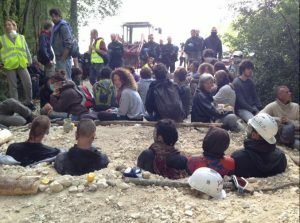 But fortunately, I have known of the activist artist, John Jordan, one of the key residents and spoke-persons for the ZAD, for many years. He made a contribution to my book, Arts for Change: Teaching Outside the Frame, New Village Press, 2009) and has kept me informed about the ZAD via email and social media. For those who are unaware of this remarkable place, it’s been a European symbol of contemporary resistance against development and fossil fuels. A coalition of movements including environmental activists, local farmers and unionists, anarchists, students and creative resistors of all sorts has prevented the building of an airport, and formed the largest autonomous zone in Europe, 4000 acres inhabited by 250 or so squatters who make up about 60 collectives. John told us that our visit was well-timed, a party was already in progress at the Ambazada, a newly built barn-like space for meetings, dances, concerts and feast. It seemed to be a celebration of the community and an opportunity to share updates on different coalitions and actions. People of all ages were sitting around on benches in deep conversations. Laughter often erupted, local wine was shared and the pleasant smell of French cigarette smoke greeted us. John introduced us to people and we were invited to grab plates and fill them generously with delicious home-made cuisine. I was struck by the plenty. Huge blocks of cheese and pâté were laid out along with bowls of salads and fruits. A crepe station and the lovely people working there supplied the crowd with warm, tasty regional fare, and we made our way to one of the big tables to learn more about this unusual community. 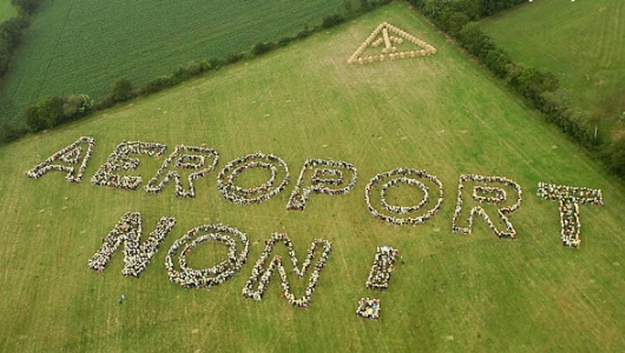 Our years of working with the Institute for Social Ecology gave us a vision of what a non-colonizing, permaculture design-informed, ecologically sound, equitable, diverse, revolutionary, liberated world might look like. We saw evidence of this vision at the ZAD. 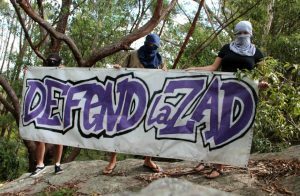 In the four days we were there we walked the land meeting members of the 60 collectives that have carved out space, built amazing structures and gardens while sharing childcare, bread, cheese, produce, tools and libraries. We spent time in long conversations, climbed the beautifully built light house for an exquisite sunset view, shared meals, sank into the literature provided at the welcome house, met grad students and journalists who are studying the ZAD, learned about ongoing conflicts between the specie-ists (those who are informed by deep ecology, who don’t believe that humans are special), the global justice activists and the traditional farmers, and discovered that this is the real work of making this vision come alive. John shared the history of battles on the land and how old coalitions between trade unions, farmers and activists were revitalized to create solidarity against the airport. We learned how art, play and humor kept the whole process joyful, even in the face of violence. It was inspiring, but we left knowing that romantic dreams were not enough to make this community sustainable. Doing ongoing anti-oppression work and non-violent conflict resolution would be the continuing task of this visionary place. 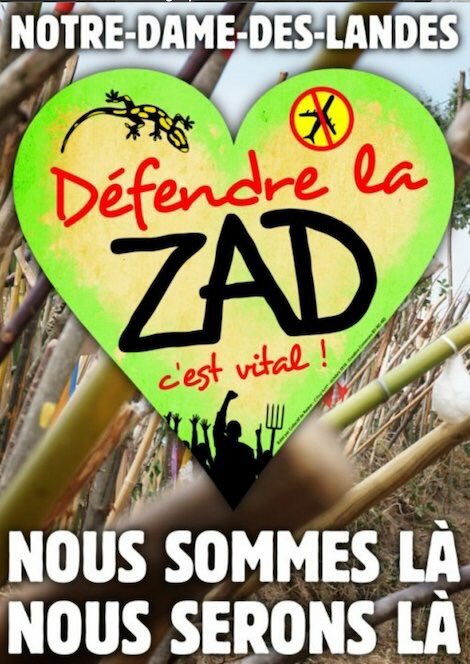 Now in this moment of extreme attacks from the State, it is important to remember that the seeds planted by ZAD can be broadcast widely, and we can be encouraged that it has survived and thrived in very difficult conditions. New communities of this kind this will be forming all over the world as the dominant culture continues to crumble. We must take heart, be resilient when there are losses and persist in making our visions emerge.